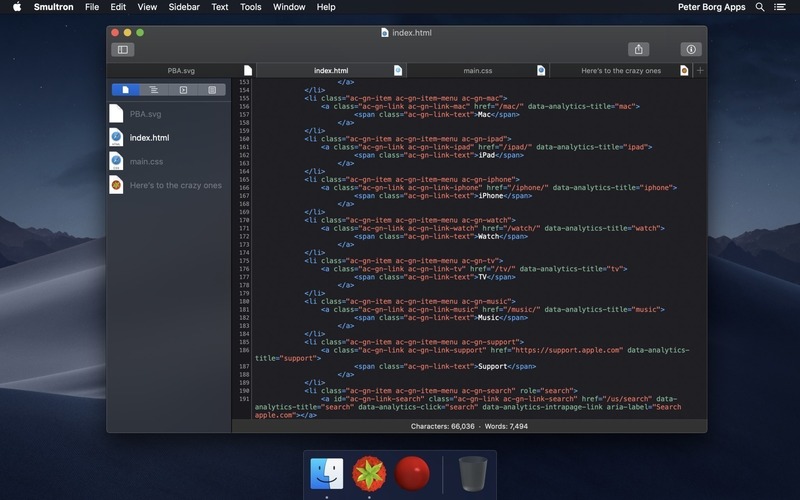 Smultron 11.1.5 – Easy-to-use, powerful text editor. Smultron 11 is an elegant and powerful text editor that is easy to use. You can use Smultron 10 to create or edit any text document. Everything from a web page, a note or a script to any single piece of text or code. Smultron 11 is very easy to use, it is fast and uses powerful technologies like auto save. It helps you to do what you want to do without getting in your way. So you can save time and get things done. Use Smultron 11 for all your text needs.. Some small bug fixes and improvements. Next story SQLPro Studio 1.0.405 – Powerful database manager. Previous story Perfectly Clear Complete 3.6.3 1448 – Photos so real, they take you places. Coda 2.6.1 – One-window Web development suite. Smultron 6.0.9 – Easy-to-use and powerful text editor.